Samsung’s next flagship smartphone will include Visa’s tap-to-pay technology widely used at grocery store check-out lines and gas pumps, the companies announced on Monday. After already announcing iPad mini competitor Galaxy Note 8.0 at Mobile World Congress in Barcelona at Mobile World Congress (MWC), Samsung is releasing details about its Galaxy S IV smartphone and how it will partner with Visa. The phone is anticipated to be announced March 15 and will include near field communications (NFC) to enable Visa’s payWave app. Users of the smartphone will bind their credit card information to the phone, and then be able to use it in place of their credit card where payWave terminals are available. The development could be a leg up for NFC payments in North America, which have been fairly muted so far despite the availability of Google Wallet and other smartphones including NFC chips. Competing mobile payments technologies could be dissuading adoption, such as QR code scanning or dongles that attach to mobile devices to allow for credit card swiping. Apple has so far avoided NFC technology for the iPhone, also limiting the availability of NFC payments for smartphone users. Given the reputation of iOS users as being the most willing to spend money using a mobile platform, the iPhone could hold a lot of clout if it enabled a mobile payment option. 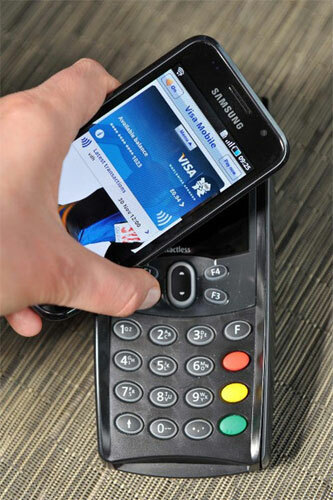 Samsung is partnering with Visa for mobile payments. Mastercard has demonstrated that NFC technology isn’t necessary for credit card industry players to extend to mobile payments, announcing at MWC that it will also accept QR codes and other methods.